Here is your comprehensive list of the 10 best restaurants in the world. Which ones can you cross off your list? Just gone on holiday or just started your honeymoon? Why not enjoy some of the best restaurants in the area, for a romantic night out for two? All unique and special in their own way, these restaurants are all well worth a visit, so take note and make that reservation now! Spain is a master in combining excellent food with beauty and atmosphere, and Granada is all that; beautiful, wonderfully atmospheric and home to some of Spain’s best cuisine. 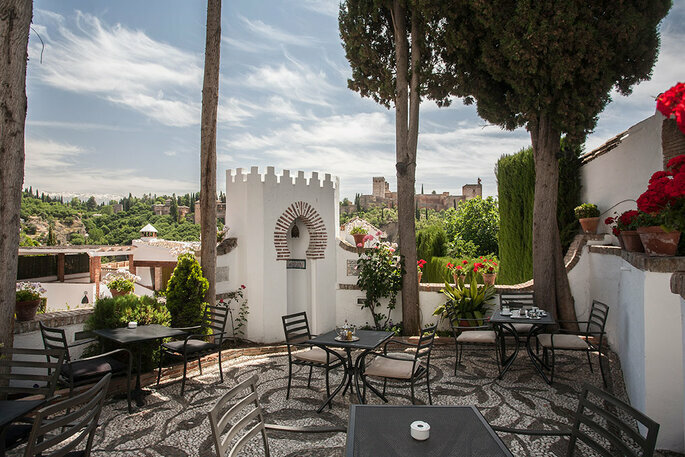 Right in the centre of Albaicín, you will find this gem of a restaurant tucked away in a moorish house built in the fifteenth century with incredible views of the Alhambra. Open morning until late evening, Aben Humeya offers a wide Mediterranean menu with an Arab twist. France is famous for its cuisine, and with good reason. Also experts in romance, rest assured that the La Tour d’Argent is the answer to your perfect romantic dinner in the city centre. 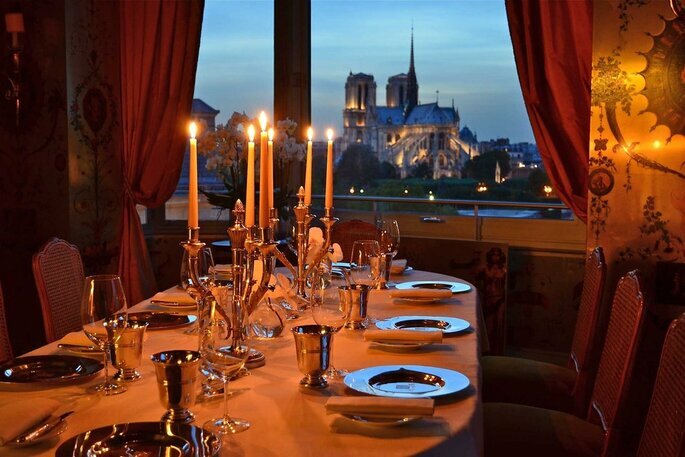 Situated near the banks of the Seine and a stone’s throw from Notre Dame, this restaurant offers a wonderful, and typically french atmosphere with ‘show-stopping’ cuisine made with seasonal produce. The perfect place for a romantic occasion to remember. The West side of New York is known as one of the most romantic areas of Manhattan with its European and slightly bohemian feel and street art. It’s in this charming quarter that you will find One if by Land, Two if by Sea. Its interior creates a relaxing atmosphere, complete with candles, open fires, a piano bar and a burgundy colour scheme with decorative lampshades throughout. Why not come along and experience this beautiful restaurant for yourself and enjoy feeling like you’re in a romantic movie. Located on a hillside in the heart of Tuscany, one of the most rural and romantic parts of Italy, Castello Banfi is the place to go for the perfect romantic dinner for two. 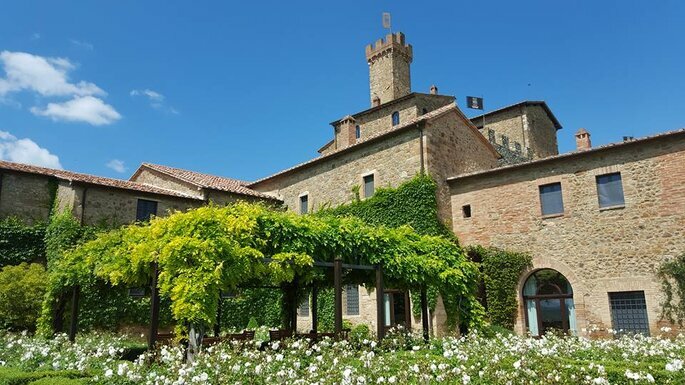 Surrounded by a wall built in 800 AD gives Ristorante Castello a traditional and medieval feel whilst its views of the rolling landscape and fields below provide a wonderfully romantic setting. Santorini is renowned for being one of the most romantic destinations in the Mediterranean. In true Mediterranean style, all the restaurants’ terraces look out onto the stunning Aegean Sea and ooze romanticism. Ambrosía serves traditionally Greek cuisine and incredible fresh seafood and local wines. In such a medieval and magical city, it’s no wonder that one of the world’s most romantic restaurants is in Dubrovnik. This highly esteemed restaurant is situated next to the Adriatic Sea, has that distinct medieval feel like the rest of the city and is known for serving some of the best food in the city. 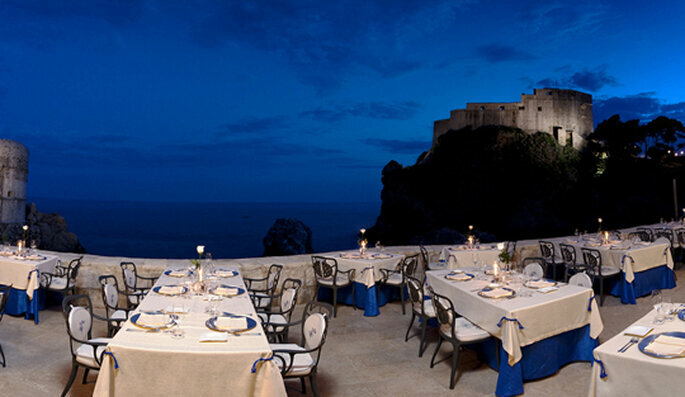 A definite must-visit restaurant for loved-up couples visiting Dubrovnik. 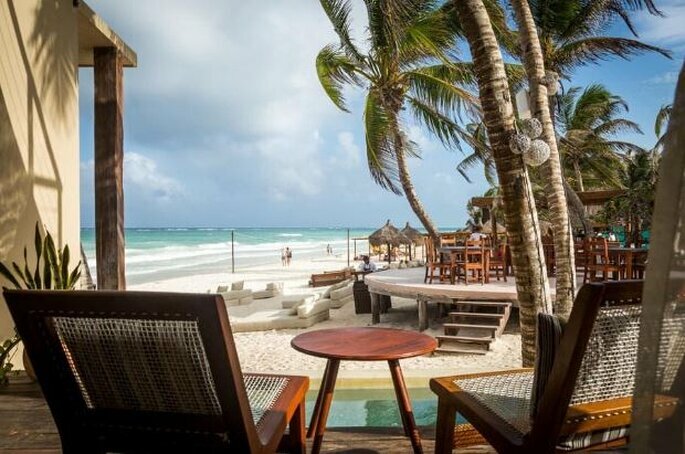 Near the Riviera Maya resort, and filled with an atmosphere of romance combined with a festive Mexican feel, La Zebra is magical. Come along and watch the sunset on the sea and relax with your other half in the restaurant’s beach huts. The menu consists of traditional Mexican cuisine with a modern twist all reflecting the country’s rich culture. This is a very special spot! 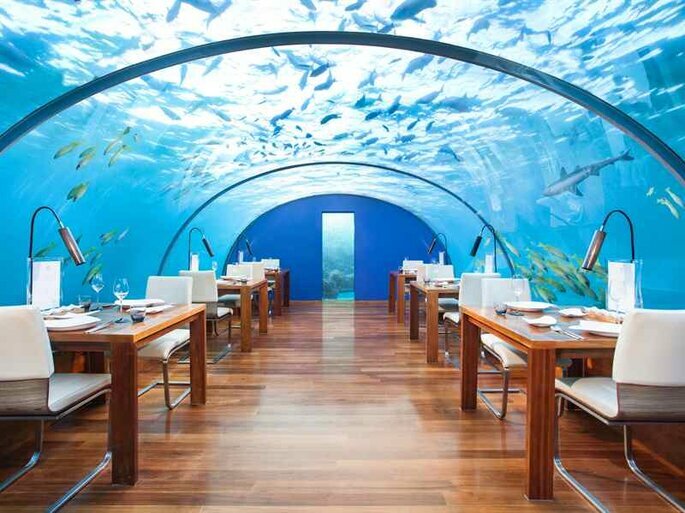 As its name suggests, Ithaa Undersea, is indeed located under water, in the sea, 5 metres below the surface, giving its diners a phenomenal view of the sea’s depths, and coral reefs, which can be seen from the restaurant’s impressive glass dome. Ithaa Undersea’s cuisine is a fusion of traditional Maldivian dishes with other influences. The restaurant is wonderfully intimate, with a capacity for 12 diners, making it the perfect spot for a special evening with your other half. This restaurant is situated at the summit of Kicking Horse Mountain in the Rocky mountains. 7700 metres above sea level, looking down into the snowy valleys of British Columbia, this is the perfect spot for feeling like you are the only people in the world. The menu consists of food typical of the Rocky Mountain region, and of course plenty of the local wines are on the menu too, along with the restaurant’s own draft beer. This is the perfect spot if you’re looking for a spot of calm with breathtaking views. 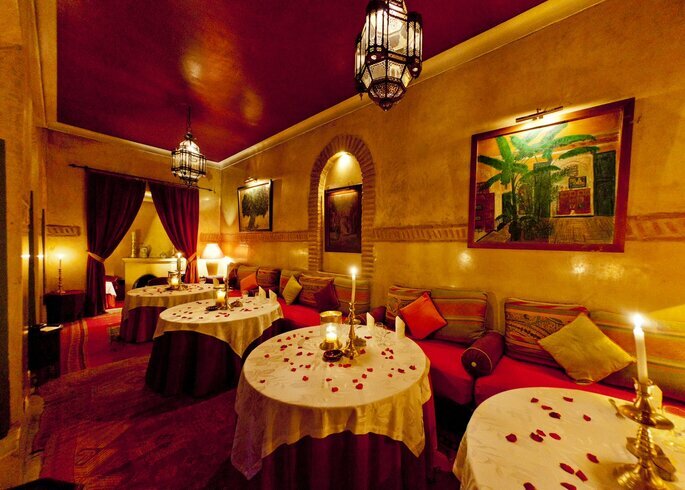 The rich Moroccan culture is alive in this restaurant, and situated near the Medina, is a popular stop-off for travellers looking for a romantic dinner for two. Come and enjoy the restaurant’s terrace where there is often live music, and where all the candlelit tables are scattered with rose petals. The menu is wonderful and consists mainly of Moroccan salads, tagines made with chicken although there are plenty of vegetarian dishes on offer too! Which of these restaurants most appeals to you? Let us know! For more honeymoon inspiration, click here.